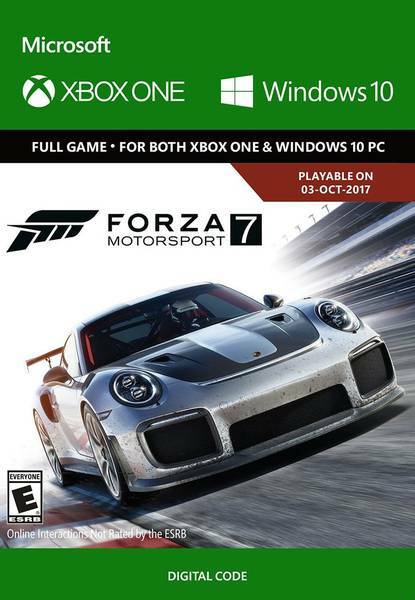 Buy Forza Motorsport 7 Xbox One/Windows 10 for Xbox LIVE on GGlitch.com | Fast, secure and easy! Experience the thrill of motorsport at the limit with the most comprehensive, beautiful and authentic racing game ever made. FORZA MOTORSPORT 7 IS AN XBOX PLAY ANYWHERE TITLE. PLAY IT ON BOTH WINDOWS 10 AND XBOX ONE! Experience the thrill of motorsport at the limit with the most comprehensive, beautiful and authentic racing game ever made. Enjoy gorgeous graphics at 60fps and native 4K resolution in HDR. Collect and race more than 700 cars, including the largest collection of Ferraris, Porsches, and Lamborghinis ever. Challenge yourself across 30 famous destinations and 200 ribbons, where race conditions change every time you return to the track. Xbox Play Anywhere requires digital purchase. Features may vary between Xbox One and Windows 10 versions of game. Xbox One game disc for use only with Xbox One systems. Xbox Live Gold membership (sold separately) required for online multiplayer on Xbox One. Cross-device play only in Xbox Live-supported countries; see http://www.xbox.com/live/countries. Some music features may not be available in some countries. Visit http://forzamotorsport.net for additional information. PHOTOSENSITIVITY SEIZURE WARNING: A very small percentage of people may experience a seizure when exposed to certain visual images, including flashing lights or patterns that may appear in video games. Visit Xbox.com for more information.